This Zucchini Cauliflower Bake is a good side dish for roasted chicken breast. It’s a healthy yet somewhat cheesy bake. You can always mix up this recipe by adding yellow squash just remove one of the zucchinis and alternate the slices with the yellow squash and if you are feeling extra brave add some mushroom slices. I never complain with the addition of more veggies. Slice Zucchini approximately a 1/4 inch thick and arrange in a 8×8 baking dish. Drizzle olive oil of zucchini and sprinkle salt. Using a food processor to pulse the cauliflower to desired texture or using a cheese grater, grate the cauliflower to a coarse texture (the goal is to make these like bread crumbs). Mix cauliflower and shredded Gruyere cheese. Lay mixture evenly over zucchini. Dot with 1 tablespoon of butter cut into small bits and bake for 20 minutes. 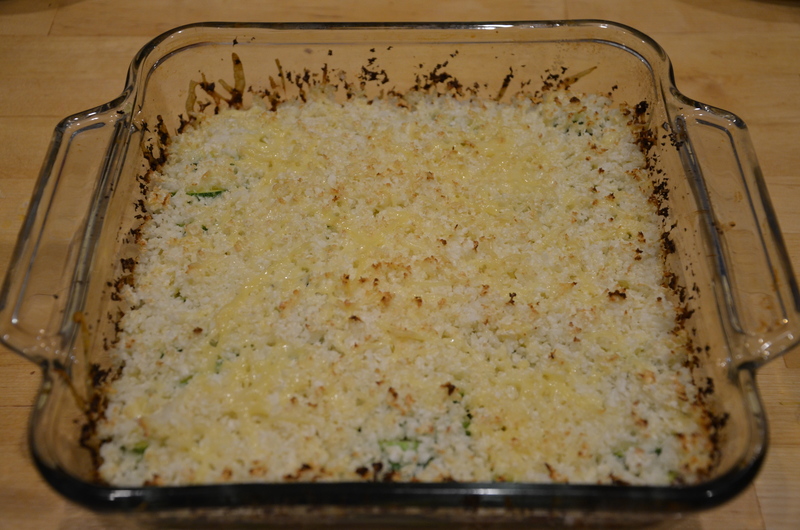 Then sprinkle Parmesan cheese on top and bake until melted.